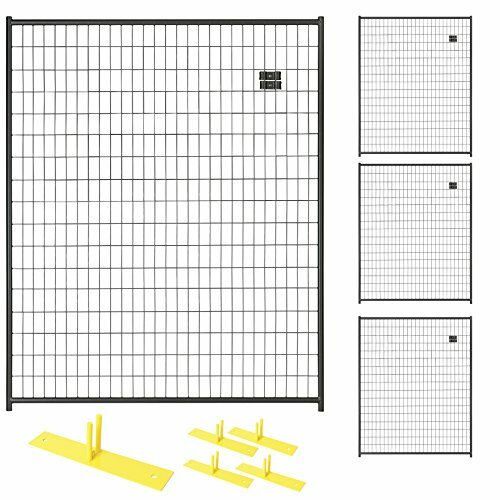 Crowd Control Temporary Fence Panel Kit - Perimeter Patrol Portable Security Fence - Security barriers create an enclosed space or linear fence panel for outdoor areas. Security fences are great for crowd control, job site security, outdoor events, enclose storage areas and more. Barricades can separate out specific areas of a location, help avoid a mix up between allocated groups of people and provide added organisational benefits such as single file queuing. Quality Construction & Design - Seamless welds on the steel panels have no fittings, giving it great durability and strength and make it easy to assemble. Easy to Setup - Pre-assembled barricade panels simply clamp together, no tools needed. Base feet plates included for stability.